The United States' trade war with China is likely to last much longer than originally thought — extending well into the second half of next year and perhaps longer, experts say. The main reason: Neither side is prepared to appear politically weak at home, and both are ready to absorb economic pain. In the U.S.: Farmers, users of steel, and consumers. And in earning calls last week, U.S. retailers "were sounding the alarm" about yet another escalation of tariffs threatened by President Trump, reports Axios' Courtenay Brown. 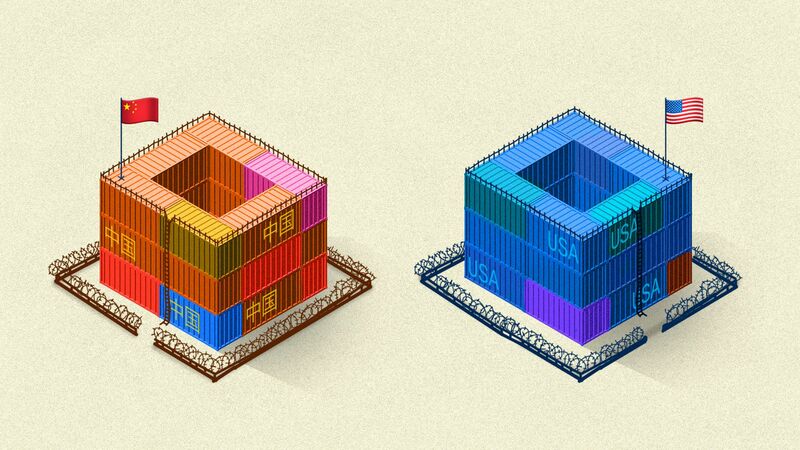 In China: Manufacturers of all types will see business leave to neighbors like Vietnam and Malaysia, experts tell Axios. For both: Economic growth will be slightly less next year, and — depending on other factors such as the psychology of stock and commodities markets — there is a small chance that part or much of the world tips into recession. The background: Trump says he is determined, among other objectives, to get China to stop hacking U.S. commercial secrets and forcing American companies to disgorge their intellectual property to Chinese rivals. And as early as Sept. 6 — 10 days from now — the U.S. may substantially escalate, levying tariffs on $200 billion in trade, and Beijing is expected to strike back. But while that is the intellectual backdrop, politically speaking, neither Trump nor China's Xi Jinping can be seen publicly buckling under to the other. And, for economic reasons, neither feels he has to. The tariffs are unlikely to inflict a killer blow. "No question it will be bad, but not calamitous" for the U.S. or China, says Adam Posen, president of the Peterson Institute for International Economics. Adding to the time clock: On the U.S. side, Trump's most hawkish advisers actually want the talks to go on longer because they smell blood. They think the tariffs threaten the Chinese miracle, and want to wait for the suffering to start biting, report the WSJ's Lingling Wei and Bob Davis. Most of the China experts whom Axios spoke with dispute this thinking. Brad Setser, an expert on China's economy at the Council on Foreign Relations, expects only about a 0.5% hit to Chinese GDP next year should Trump, as he has threatened, escalate to tariffs on $250 billion of Chinese goods — or half its exports to the U.S.
What's next: Ian Bremmer, president of the Eurasia Group, is forecasting the unfolding of a new Cold War next year between the U.S. and China, this time on the battleground of technology and influence over other countries. "By the end of 2019, I suspect the biggest headlines on U.S.-China will be more focused on a changing global power balance than a direct trade war," he tells Axios in an email exchange. Kaveh Waddell writes: When the film Minority Report was released 16 years ago, its hyper-targeted ads were a creepy window to the future. Now, millions unlock their iPhones with their faces every day, edging a technology that, to many, still seems invasive toward the mainstream. Will biometrics go viral? Turow says yes, but when it does, voice identification may take off before facial recognition. For more than two years, we've been speaking of the threat to the liberal world order, shaken to its core by the rash of new autocratic-minded governments, and, most importantly, a change of heart by its creator and leader — the United States. But this summer, I realized that I could know a lot more about what the world order actually is. On my bookshelf all this time, unread, was "World Order," by Henry Kissinger, secretary of state and national security adviser to presidents Nixon and Ford. Over the last couple of weeks, I've dug in. "Presidential campaigns are on the verge of turning into media contests between master operators of the Internet." As more and more discourse happens in snippets on social media, "can democracy avoid an evolution toward a demagogic outcome based on emotional mass appeal rather than the reasoned process the Founding Fathers imagined?" A hyper-troubling thread is Kissinger's description of the bedrock of U.S. power from the beginning, and especially since World War II — its claim of moral high ground. Always, Americans have argued that other countries sought their cold, hard state interests, while the U.S. was foremost about values and ideals. "Calculations of power without a moral dimension will turn every disagreement into a test of strength; ambition will know no resting place; countries will be propelled into unsustainable tours de force of elusive calculations regarding the shifting configuration of power." Fun fact: In the end notes, we see that, typically, Kissinger has eyes deep in the White House. Schuyler Schouten, his research associate on this book, is special assistant to Trump and associate White House counsel. Amid a gaping shortage of skilled cybersecurity hands, a cottage industry has sprung up to fill the demand, with some of the biggest U.S. companies and agencies paying freelance bounties for detecting website vulnerabilities. What's going on: There are currently some 301,000 cyber industry openings in the U.S., according to Cyber Seek, a firm seeking to close the shortage, forcing unorthodox solutions on the most strategically important employers. Their target is not hiring college graduates, but simply to lure reliable hackers, or "white hats," out of dark chatrooms and into respectable employ. Websites like Bugcrowd and HackerOne are the Indeeds of this world, reports MIT Tech Review's Martin Giles. Both sites feature "bug bounties" — cash rewards for finding website vulnerabilities. Among those paying bounties: Airbnb, the Pentagon, GM, Lufthansa, and Starbucks, says HackerOne. Despite the shortage, the pay appears to be generally mediocre or low, the same malady afflicting job categories across the U.S. and European economies. Finding bugs pays in glory more often than in cash, like swag and tours of the U.S. Capitol, writes Tech Review's Erin Winick. In a case study at HackerOne, Shopify said that as of March 15, it had used bounties to resolve 759 bug reports, "thanked" more than 300 hackers, and paid out more than $850,000 in bounties. If all were paid, that comes to about $1,100 per bug report, although in one case, Shopify said, it paid a hacker named @cache-money $15,250 for exposing a critical bug. A Philippine bug hunter profiled by Tech Review earns well under $1,000 a month. At HackerOne, 3% of registered users earn more than $100,000 a year, while 12% earn $20,000 or more. In February, No Starch Press will publish a how-to book called Real-World Bug Hunting, by Peter Yaworski, subtitled "A Field Guide to Web Hacking." A bill to require the State Department to offer bug bounties.